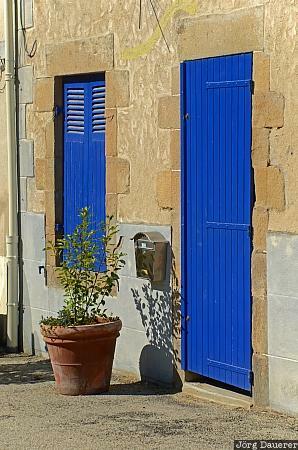 The facade of a house with blue door and a window covered with blue shutters in Auray on the banks of the river Loc'h. Auray is southern Brittany (Bretagne) in the north-western part of France. This photo was taken in the evening of a sunny day in May of 2011. This photo is part of the exhibition The color Blue (June 2011). This photo was taken with a digital camera.